Charming and rustic, these day chairs will look wonderful in indoor and outdoor spaces alike. Featuring a square shape, these teak garden chairs have an enclosed style which is undeniably cosy. Made from the finest grade-A teak, our day chairs are sturdy and extremely durable, guaranteeing longevity. 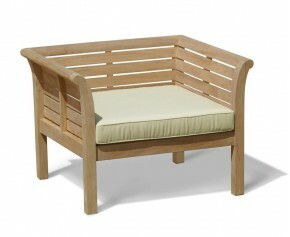 This teak daybed chair represents brilliant value for money. Expertly manufactured from sustainably sourced, plantation grown teak this teak day chair has been designed to stand the test of time and can remain outdoors all year round with minimal fuss, ensuring trouble free pleasure for years to come. 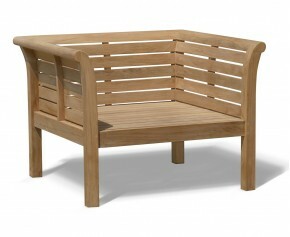 Turn your garden day-chair into a more luxurious prospect with the addition of this great value outdoor seat cushion. Expertly woven in polyester for long life and aesthetic appeal, this outdoor seat cushion features a 12cm thick SuperiorFoamFill® inner pad for extra comfort and has been finished with a stylish double piping edge. Able to remain outdoors all year round no matter the weather, our teak garden chairs require minimal maintenance and are a smart choice for any home. The contemporary design of our day chairs works well to modernise existing furniture and add a touch of style to your space. Choose from our range of day chairs.